With 0.50" high LCD digits and detachable screw terminals. Loop-powered or "self-powered." 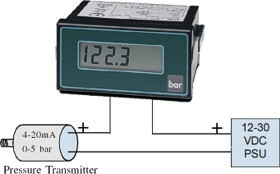 The 88-PRO LCD process meter may be connected directly to a 4-20 mA, 10-50 mA or 1-5 mA current loop, with no need for additional power to the meter. This "self-powered" LCD process meter is powered directly by the current loop, developing a maximum voltage drop of 2.5 V.
Easy to install and set up. The 88-PRO fits in a standard 1/8 DIN panel cutout and only requires 93 mm (3.66") behind the panel. This is less than for most process meters. There are only two signal connections: signal in and signal out. These are made via a detachable screw terminal connector. All range-selection jumpers as well as the meter's zero and span adjustments are from the rear of the meter, avoiding the need to open the case. Attractive and easy to read. The facia of the 88-PRO is attractively styled. The simple bezel will complement your panel design. The lens protects all legends and markings, so repeated wipe-downs won't damage the lettering or display clarity. 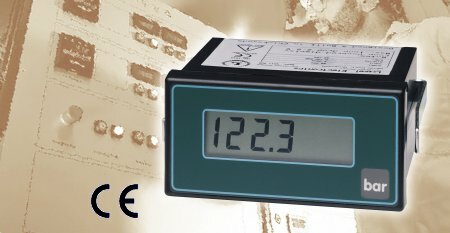 High contrast LCDs make these meters suitable for use in bright environments. The digits measure a full 12.7 mm (0.50"). An application example. The 88-PRO loop-powered process meter is in series with 12-30 Vdc power to a two-wire 4-20 mA pressure transmitter, which measures the pressure at the bottom of a straight-sided tank. The meter's wide scaling capabilities allow it to be adjusted to display the volume of the tank. If necessary, one or two dummy right hand zeros can be selected to display values up to 199900. Width behind panel 98 mm (3.86") max.